Hinton is a town in west-central Alberta, Canada.It is located in Yellowhead County, 81km northeast of Jasper and about 284km west of Alberta's capital city, Edmonton, at the intersection of Yellowhead and Bighorn Highway, in the Athabasca River valley. Take a break from the city and head to The Beaver Boardwalk and Athabasca Riverfront Park. You'll explore the less-touristy side of things at Hinton Bike Park and Entrance Ranch. Change things up with a short trip to Adrenaline & Extreme Tours in Grande Cache (about 1:40 hours away). There's much more to do: stroll through William A. Switzer Provincial Park, take a pleasant ride with a tour on horseback, and tee off at Hinton Golf Club. To see other places to visit, traveler tips, ratings, and tourist information, you can read our Hinton holiday planner. Toronto to Hinton is an approximately 10-hour flight. The time zone changes from Eastern Standard Time to Mountain Standard Time, which is usually a -2 hour difference. When traveling from Toronto in July, plan for slightly colder days in Hinton, with highs around 28°C, while nights are cooler with lows around 7°C. Finish up your sightseeing early on the 13th (Thu) so you can travel to Jasper. Jasper is a specialized municipality in western Alberta, Canada. Eschew the tourist crowds and head to Mount Edith Cavell Trail and River Rafting & Tubing. Get in touch with nature at Medicine Lake and Columbia Ice Field. Next up on the itinerary: take your sightseeing to a higher altitude at Mt. Edith Cavell, explore the activities along Maligne Lake, explore the stunning scenery at Sunwapta Falls and Canyon, and tour the pleasant surroundings at Skyline Trail. To find more things to do, reviews, other places to visit, and other tourist information, read our Jasper itinerary planner. You can drive from Hinton to Jasper in an hour. In July, daytime highs in Jasper are 28°C, while nighttime lows are 7°C. Finish up your sightseeing early on the 22nd (Sat) so you can catcht the bus to Lake Louise. 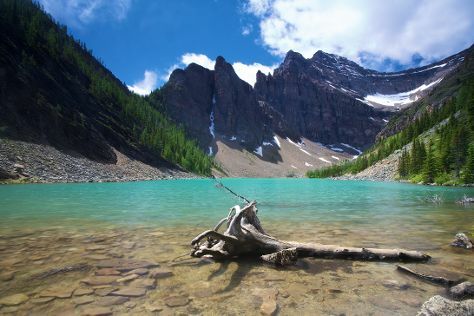 Take a break from the city and head to Lake Agnes and Bow Lake. Eschew the tourist crowds and head to Adrenaline & Extreme Tours and Athabasca Glacier. On the 28th (Fri), spend an exhilarating day on the slopes at The Lake Louise Ski Resort. There's much more to do: explore the activities along Peyto Lake, admire all the interesting features of Icefields Parkway, tour the pleasant surroundings at Bow Glacier Falls Trail, and appreciate the extensive heritage of Fairmont Chateau Lake Louise. For maps, reviews, other places to visit, and more tourist information, refer to the Lake Louise itinerary planner. Getting from Jasper to Lake Louise by bus takes about 2.5 hours. Other options: drive. Traveling from Jasper in July, expect nights in Lake Louise to be about the same, around 6°C, while days are slightly colder, around 23°C. Wrap up your sightseeing on the 29th (Sat) early enough to drive to Waterton Lakes National Park. Established in the 1890s and named after a celebrated Victorian naturalist, Waterton Lakes National Park encompasses a variety of landscapes that include mountains, freshwater wetlands, prairie grasslands, aspen forests, and lakes. 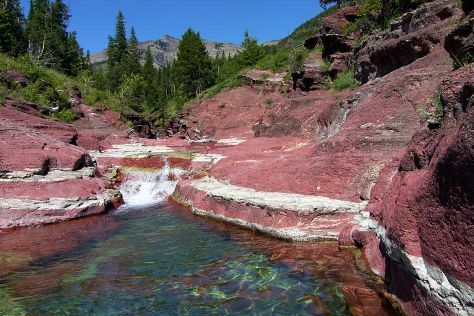 Get outdoors at Upper Waterton Lake and Red Rock Canyon. Step off the beaten path and head to Cameron Lake and Bertha Falls. There's much more to do: trek along Crypt Lake Trail, stroll through International Peace Park Hike, identify plant and animal life at Bertha Lake, and take in the dramatic scenery at Cameron Falls. To see photos, other places to visit, and tourist information, read Waterton Lakes National Park trip generator. Traveling by car from Lake Louise to Waterton Lakes National Park takes 5.5 hours. Alternatively, you can take a bus. Traveling from Lake Louise in July, expect Waterton Lakes National Park to be somewhat warmer, temps between 28°C and 10°C. Wrap up your sightseeing on the 3rd (Thu) to allow time to travel to Crowsnest Pass. Part of the colossal mountain range of the Canadian Rockies, Crowsnest Pass is a combination of five towns united by rocky forests and raging rivers. Kick off your visit on the 3rd (Thu): take in the dramatic natural features at Crowsnest Pass, take in the awesome beauty at Frank Slide Interpretive Centre, and then appreciate the history behind Hillcrest Mine and Cemetery. Get ready for a full day of sightseeing on the next day: make a trip to Leitch Collieries Provincial Historic Site, then admire all the interesting features of Bellevue Underground Mine, and then play a few rounds at Crowsnest Pass Golf & Country Club. For reviews, maps, traveler tips, and other tourist information, use the Crowsnest Pass vacation planner. You can drive from Waterton Lakes National Park to Crowsnest Pass in 2 hours. Traveling from Waterton Lakes National Park in August, expect a bit cooler with lows of 6°C in Crowsnest Pass. Wrap up your sightseeing on the 5th (Sat) early enough to travel to Canmore. You'll explore the less-touristy side of things at Banff National Park and Tunnel Mountain Trail. Get in touch with nature at Ha Ling Peak and Canmore Cave Tours. Venture out of the city with trips to Banff (Lake Minnewanka, Cave and Basin National Historic Site, & more). On the 13th (Sun), spend an exhilarating day on the slopes at Sunshine Village. There's lots more to do: take your sightseeing to a higher altitude at Sulphur Mountain, contemplate the waterfront views at Grassi Lakes, hit the slopes at Canmore Nordic Centre Provincial Park, and explore the stunning scenery at Johnston Canyon. To find photos, where to stay, and more tourist information, go to the Canmore trip itinerary maker. You can drive from Crowsnest Pass to Canmore in 3.5 hours. In August in Canmore, expect temperatures between 26°C during the day and 7°C at night. On the 15th (Tue), wrap the sightseeing up by early afternoon so you can travel back home.